McCain 332L Controller Cabinet - J.O. 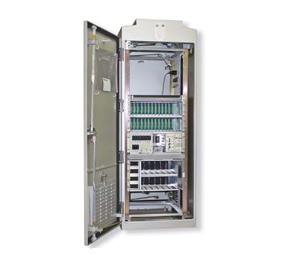 Herbert Co., Inc.
McCain’s 332L Controller Cabinet, an enhanced version of the 332 industry standard cabinet that is eco-friendly and energy efficient, meets the industry standard 170/2070 style cabinet specifi cations designed for controlling intersections. In full compliance with the 2009 Caltrans Transportation Electrical Equipment Specifi cations (TEES), the quality materials used and its rugged construction make it an excellent traffic controller cabinet when an environmentally friendly, dependable, and lowmaintenance installation is required to control traffi c signals. The 332L’s green design reduces energy consumption through the use of a power-saving, high-effi ciency power supply and eliminates the use of the harmful toxin mercury.